Heavy sleepers and the hearing impaired can rest easy with VibroBlue, an alarm clock with built-in speakers that takes an innovative approach to waking up with a vibrating "Shaker". Placed under your pillow, this "Shaker" will vibrate when it's time for you to start your day. It's also a great solution for college students and couples who share a room and want to wake discreetly. VibroBlue gives you the option to wake with a traditional alarm such as the radio with or without the "Shaker," so you can customize your experience based on your preferences. 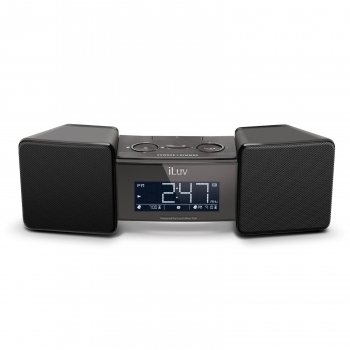 Not just an alarm clock, VibroBlue is Bluetooth-enabled with built-in speakers, and a USB charging port that allows you to both stream music wirelessly and charge your phone. Unlike traditional alarm clocks which feature a simple mono-speaker, VibroBlue was built with full-range speakers that play your favorite songs with great clarity and balance. This is one alarm clock that doesn't compromise on audio, so you can use it for more than just a simple alarm to wake you up. Stream music from anywhere in the room to enjoy music straight from your mobile device. Whether you're studying for an exam or getting ready to hit the town, you can control your music from your phone effortlessly. Its the ultimate convenience for your busy lifestyle.